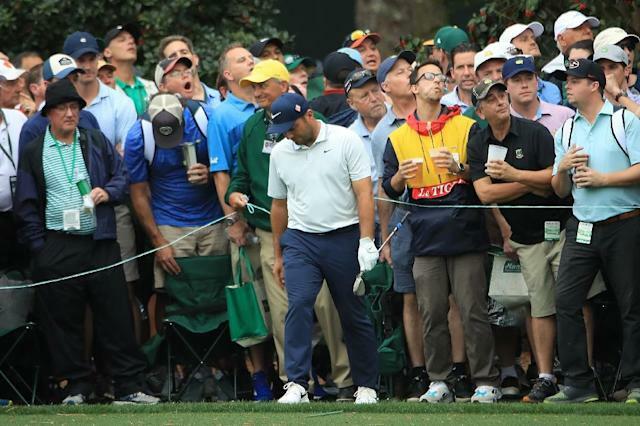 Augusta (United States) (AFP) - Francesco Molinari's Masters drowned on the back nine at Augusta National, where the Italian's two double bogeys set the stage for Tiger Woods's dramatic triumph. Italy's reigning British Open champion, who started the day with a two-shot lead, rolled in putt after putt to keep playing partner Woods at bay through 11 holes. His lead stretched to as many as three as he methodically parred the first six holes -- and Woods surrendered a shot. The first chink in Molinari's armor showed at the seventh, where he was unable to salvage par after missing the green -- the first time in 20 attempts in the week that he failed to get up and down. He rebounded with a birdie at eight, and was up by two heading to the par-three 12th when the real disaster struck. Molinari risked the longer carry over Rae's Creek toward the pin -- and didn't make it. "Just a bad execution," Molinari said. "I think we picked the right shot. At the par-five 12th he missed the fairway and laid up. His third shot arched high into the air and clipped a tree branch, dropping straight into the water in front of the green. Molinari's miscues -- after two straight bogey-free rounds had put him in the lead -- opened the door not only to Woods but a bevy of other players -- with as many as five tied for the lead on 12-under as the tournament came down to the final holes. Woods separated himself with birdies at the par-five 13th and 15th and par-three 16th and won by one after a bogey at the last as Molinari settled for a two-over 74 and a share of fifth place on 11-under 277. "Sometimes it is your day and sometimes it isn't," Molinari said. "But I'm really happy of the way I felt out there today. I was calm, collected, never panicked, even after the first double bogey, and I'll learn a lot, I think, from today." Although he appreciated Woods's achievement in winning a 15th major title after an 11-year drought, Molinari wasn't swept up in the general euphoria that greeted the US superstar's victory. "Actually, you start losing a bit of adrenaline," he said of limping home. "But it's nice to see his story, his comeback and to be a witness in first person."